Maldivian President Ibrahim Mohamed Solih is on a three-day state visit, his first foreign trip after assuming charge of the top office in the island nation a month ago. 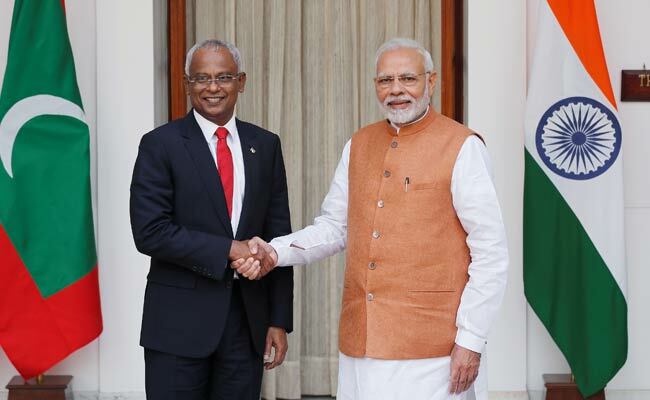 Prime Minister Narendra Modi on Monday held wide-ranging talks with Maldivian President Ibrahim Mohamed Solih with an aim to begin a new chapter in bilateral ties which came under strain under the previous regime in Male. Mr Solih arrived on Sunday on a three-day state visit, his first foreign trip after assuming charge of the top office in the island nation a month ago. PM Modi had attended Mr Solih's swearing-in ceremony on November 17. "PM @narendramodi warmly received President @ibusolih ahead of delegation level talks. During his visit to Maldives for the President's inauguration in November, PM had extended an invitation to President Solih to make a State Visit to India," MEA Spokesperson Raveesh Kumar tweeted. Earlier, External Affairs Minister Sushma Swaraj called on Mr Solih and discussed bilateral and regional issues of mutual interests. Relations between India and the Maldives deteriorated after then president Abdulla Yameen imposed emergency on February 5 this year. India had criticised his decision and asked his government to restore the credibility of the electoral and political process by releasing political prisoners. The emergency lasted for 45 days.